We collect information on criminal activity through our network of members all over the country. We then turn it into intelligent data and disseminate this information to the relevant members. 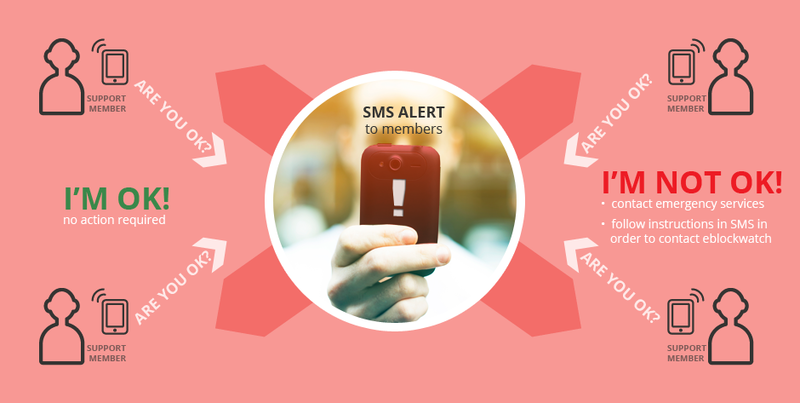 Members receive information by sms or email pertaining to crime in their particular suburb. As a member, you can report criminal activity that you observe in your area on the Report an Incident page, and this will be shared with other members in your suburb or industry. Assist its members through its members (via the CommUnity button). We assist our members through our members via the CommUnity button. The CommUnity button provides people with the technology to let each other know when they need help in the case of an emergency. The CommUnity button (which is also known as a 'panic button') is a service that you can sign up for with eblockwatch. When you dial this number your 4 friends receive an SMS telling them that you need help. So at the click of a button you have notified 4 people who care about you that you are in a dangerous situation! We work on the philosophy that a member must look after themselves, their loved ones and those around them and collectively we look after each other. Remember eblockwatch is neither a security company nor a reaction organisation. We disseminate information and mobilise communities and members to report and fight crime in their areas. Eblockwatch is a network of networks which include: Neighbourhood watches, police task teams, specialized industrial support teams, security companies and police reservists, South African Women's Agricultural Union with its 10000 members scattered across South Africa, Township patrols, and most importantly over 79000 ordinary South Africans. As each member reports incidents and spreads the word about criminal activity, so the more members are informed and the safer our members become.